A new spot for me. It’s in Ginza. Wasn’t aware of it before. Thanks! Happy to say not long at all. I was out with the missus, so it wouldn’t have been fair to stand there for ages. But only needed about 5 mins and half a dozen shots or so. Once I got this, I was happy to call it a day. Could have probably stayed there another hour and still not got anything better matched. 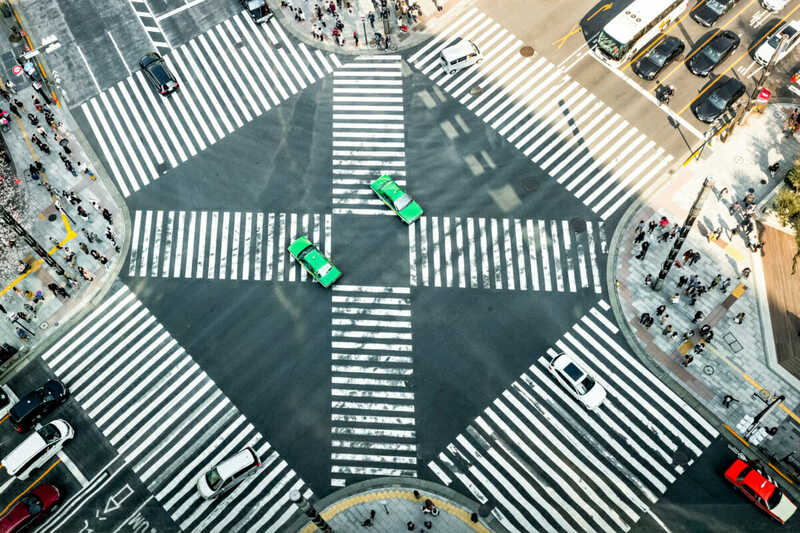 The emptiness combined with the two taxis of the same color so perfectly aligned gives the impression that this intersection is at a standstill. But I imagine that’s not the case at all. Yeah, that sparseness is great, isn’t it? Definitely not at a standstill at all, but for the briefest of moments it did feel like that. Thanks. Having initially just been happy with the taxis, those extra little details are a real, and admittedly unplanned bonus. The cherry blossom I was keen to include, but the rest not in the slightest. Oh, and I’d definitely like to imagine those people are looking back up! Thank you. Definitely along the lines of what I wanted, but really didn’t expect to get it.